As I’ve mentioned before, my family takes a trip almost every summer to Northern Wisconsin. One of the marks of being up north is the prevalence of cherry everything and in everything. You name it, you can buy it. Cherry salsa? You got it. Cherry cocktails? No problem! But the best discovery is at our favorite cherry orchard in WI, cherry donuts. At first I was all ‘Whatever, it’s a donut, right? No biggie.’ but then I tried one and was like ‘Give me 2 dozen please!’. We have been buying these donuts for a few years, bringing home/eating on the way home only a 6 pack, but it was high time I tried my hand at making them myself. We stopped here on our recent food bloggers trip up North and everyone was all in on the donut front, I think we purchased a couple packages and did a decent amount of damage to them. I believe it was my friend Karis who started out by saying ‘I’m only going to have half of one’, which turned into a whole one..which maybe turned into another one? Either way, the real deal donuts are incredible, but I’ll take these until I can make it up there myself! The original donuts are more of a pink color, which I think can be achieved with a bit of red food coloring. I didn’t have any on hand, so I used the juice from the maraschino cherry jar, but feel free to use a bit of food coloring as well. Want more donuts? 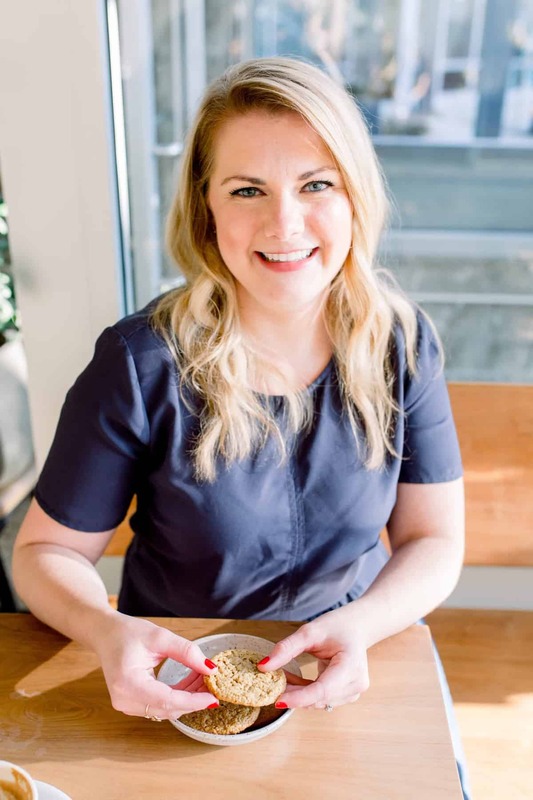 (Duh) The Faux Martha did a round up of a few other awesome bloggers who are taking part in this national day of donuts. Check them out! Preheat oven to 350 degrees F. Grease a donut pan and set aside. In a medium bowl, whisk together the flour, baking powder, baking soda, and salt. Stir in the maple syrup, apple cider vinegar, vanilla, non dairy milk, cherries and cherry juice. Stir until combined. Fill wells of the donut pan about 3/4 full, until all batter is used. Bake for 15-20 minutes, or until golden brown. When cooled, dip in melted vegan butter and sprinkle with granulated sugar. 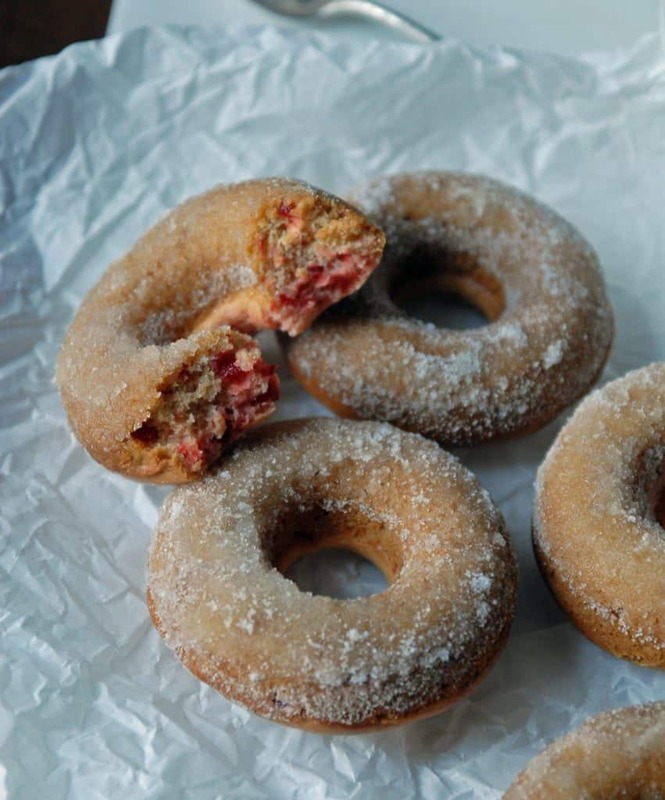 Guilty as charged 🙂 I surprised myself with how much I liked the Door County cherry donuts and would love to try your version. Abby, these look seriously delicious! 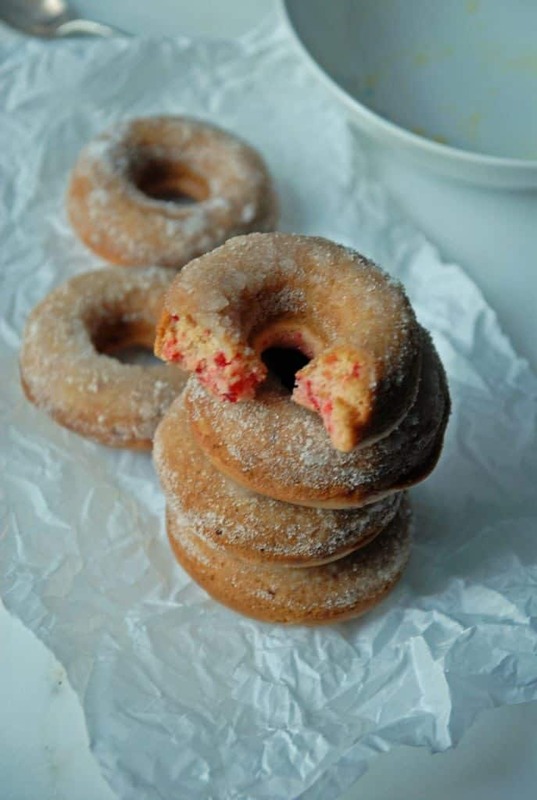 I have been dying to make homemade doughnuts (I never know when to use the spelling donuts vs. doughnuts lol) and after seeing this, I have a new summer mission-buy a doughnut pan and make some doughnuts! 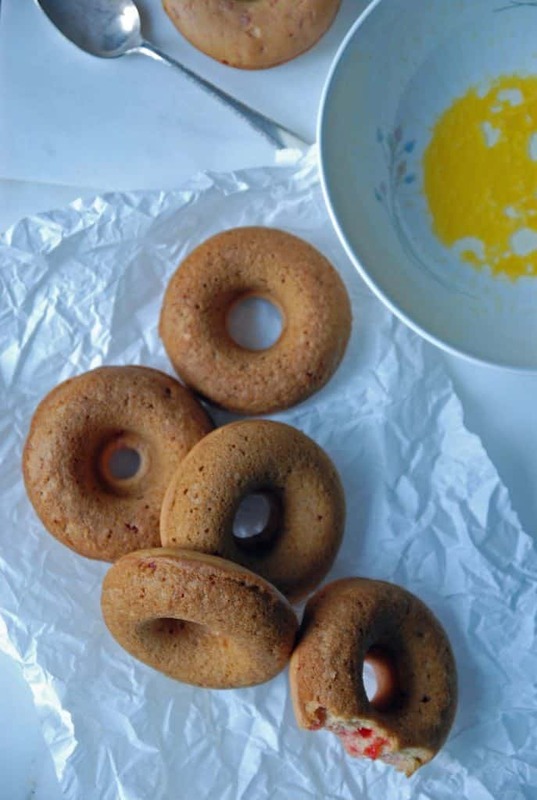 Your recipes always turn out so good, so I think I’m going to have to make these as my first doughnuts – I’ll let you know how they turn out! ALSO-we always go to visit my husbands’ grand parents ‘up north’ and I have come to really appreciate and love all things ‘cherry’…last time we were ‘up north’ I had cherry wine for the first time! Girl you need to get on the donut pan situation! I will make a batch before I come or when you come up to Door Co! Love you! Oh my! These look amazing. They sound healthier too since you bake them. I will give his recipe a try. You are right, baking makes them a little healthier, so we can eat more, right?! Those look awesome! Anything with “sugared” in the title has to be good. 🙂 Love the cherry flavors!